Inspired by this weeks MoJo Monday Sketch and the colors at The Paper Players, I came up with this CAS (for me) card using this sentiment from Stampotique. I masked the sentiment to be able to stamp it on both panels. The butterfly is die cut using Spellbinders Butterfly die, on pattern paper. that's a beautiful card and I love the sentiment, very nice. The card stock colors go very nicely together. Such a beautiful sentiment and butterfly! Wonderful card! Pretty card and a beautiful sentiment! thanks for playing with the Paper Players this week! What a beautiful card. I thought it may be an altered tray. You have the best sentiments out of anyone! I thought that butterfly was metal...I am surprised it is of dp! The papers and the Black ZVA Flourishes are stunning! Beautiful papers! 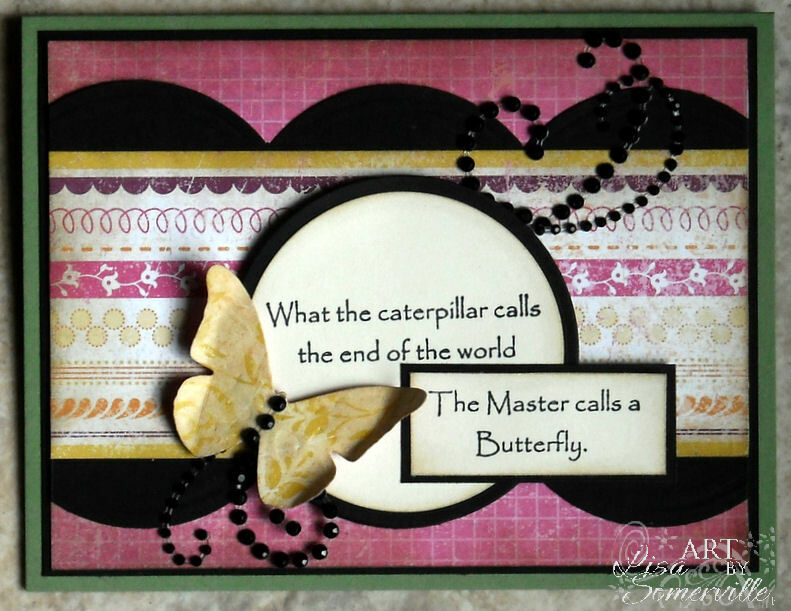 Great colors on this card, perfect sentiment with the butterfly. Beautiful card Lisa, love that sentiment the combination of papers is perfect! Beautiful combination of colors and papers! Love the bling flourish! Thanks for joining us this week at The Paper Players! Such a pretty card, Lisa! I love how you have used the colours. That is such a lovely sentiment too. Thanks for playing along with The Paper Players this week! Beautiful card. Lovely papers and the sentiment is beautiful! Beautiful, beautiful. Love the combination of papers and shapes and colors. Love that sentiment and it's perfect divided. Beautiful card, Lisa! I love the rhinestone flourish! Thanks for playing with The Paper Players!